I really don't mind spending the $$ for added safety and efficiency but is it still necessary in 2017? My dealer seems confidant that it is not but I've learned to trust forum members more. I spent hours and hours on fixing this so hopefully I can save you all some time. I've towed 15k+ miles with my 7500lb race trailer and it's a breeze. Just wanted to say thank you to 383Vett for providing the wiring diagram. Shout out and thank you and another example of how this forum is great. I know I'm brining back this old post but I also wanted to confirm to others this works on 2016 models. Sorry to bring back an old thread. But wanted to ask a question about this comment. Does that mean your 2012 rrs plugged into the 3035 Ford harness without the need to move any wires? You only had to move wires when using it in the newer rrs? I have a 2012 rrs and just installed the Tekonsha p2. I used the 3035 Ford harness as it came (didn't move wires) . I believe it works as it turns on, I press the button on the right and number 6 comes up, if I press it again it goes 6/1, 6/2 and 6/3. I believe it's working correct? Plugged in properly? Took my new 28' Airstream out for it's 1st trip this weekend and had major issues with the Prodigy RF brake controller. Thankfully very helpful and nice full-timers in our two campgrounds were able to help us out - I bet they had a good laugh after we rolled out though. 1. Dealer installed the RF brake controller on the tongue of the trailer, and did the initial pairing to the RF handheld with a Ford pickup truck as they know that the Range Rover is not capable of pairing with the RF brake controller. 2. After moving the RF handheld to the Range Rover, it worked well all the way down to the 1st campground, where we unhitched. 3. On the day of departure on the 1st campground, we connected the RF handheld but got a flashing 'NC' which indicated that the handheld had amnesia. 4. We found someone in the campground who had an older pickup truck, but it had an aftermarket 7-way so it was not capable of pairing. We found someone else with a newer truck where we successfully paired and we were on our way to the 2nd stop. 5. Handheld had amnesia as we were leaving the 2nd stop, and I was able to borrow the helpful camphost's truck to pair the handheld again. I also want to note that the Curt LED 7-way Adapter DOES NOT WORK, and even if it did, it is poorly constructed. As the 7-way entry point on the Airstream is a very tight fit, and the LED tail lights are a sealed unit, I'm having my solar/lithium installer do the resistor work for me. Is this the right connector? Amazon asked me to input my vehicle info and said it was not the right connector. Last edited by RRToadHall; June 30th, 2018 at 12:44 AM. 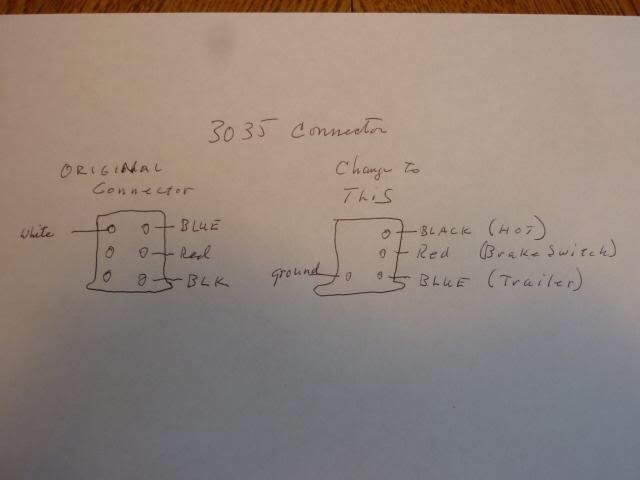 Yes the 3035 is the right connector. Check Teknosha's site and you'll see it's compatible with the 2014 RRS. The 3035 tekonsha connector for the Prodigy P3 on the 2017 RRS works correctly out of the box. Don't need to move the white and black wires. Unfortunately, the LED trailer is not picked up by the car. I tried both the curt and etrailer brand LED adapter. Neither worked. Does anyone know for a fact that the transmission / shifting program is controlled electronically via "knowing" that the trailer is connected? I installed the 3035-P into my 2018 RR Sport TD6. The pinout locations on the harness in the truck are correct with the adapter harness. It installed and works perfectly.